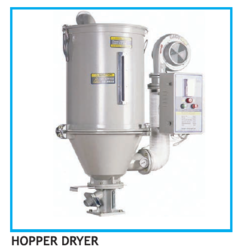 Offering you a complete choice of products which include hopper dryer. Hopper Dryer is widely used in extrusion and injection molding of plastics, a combined feeding, and drying device in which hot air flows through the hopper. In addition to good aesthetics and durability. Hopper Dryer is also characterized by its precision control of temperature for the purpose of greatly improving drying efficiency. Effect on ultra-drying and decreased cycled time.